Electrician in Taunton: We pride ourselves on our customer service, get in touch to discuss your electrical requirements. ASM Electrical are Taunton Electricians and are a NICEIC registered company and in partnership with ASM Security Systems. Electrician in Taunton with a vast amount of experience, qualifications and knowledge in the Electrical industry. ASM Electrical have experience in not only wiring new build houses but rewiring historical electrical systems ensuring all work meeting current regulations. Our proven track record through impartial reviews reflect our professionalism and dedication to deliver the service to meet customer’s electrical requirements. 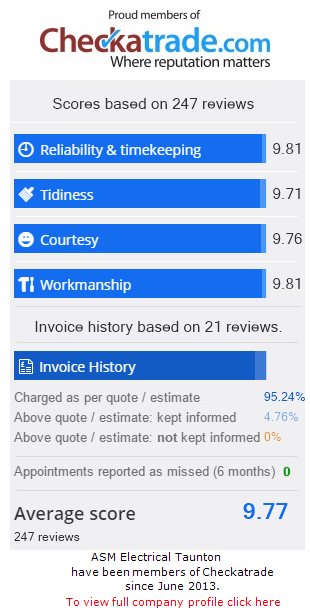 Unlike many other in the industry, we don’t charge for a call out fee. We asses each electrical requirement or issue independently and offer a no-obligation free quotation for all work. Our pricing structure for all electrical quotations (both domestic and commercial) are easy to read and understand. We can offer a 10% discount for electrical work required to improve quality of life for the elderly and/or disabled. Get in touch for a free, fixed-price quotation for any electrical work in Taunton, Bristol or Exeter. ASM Electrical do not only benefit from many years of electrical experience that comes with an established company, we are also highly qualified and take pride in continued professional development.